Peonies start the summer off with a bang. Their showy, often fragrant, blooms are hard to resist. The plant is a familiar perennial. Many people have childhood memories of the flowers growing in a grandparent's yard. Peonies remain an essential ingredient for any mixed flower border. Flowers bloom in late spring or early summer, and their deeply cut leaves remain attractive all summer long. 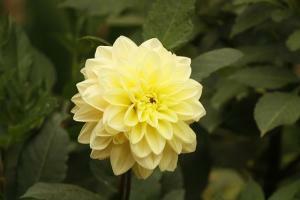 Hundreds of cultivars are available in colors such as pure white, pale pink, pale yellow, crimson, and fuchsia. Flowers may be single, semi-double, double, or Japanese type. Japanese type flowers have a ring or two of petals around a cluster of fluffy, modified petal-like stamens. Are Roses or Peonies More Expensive? Plants are easily grown in zones 3 through 8. They thrive in full sun. 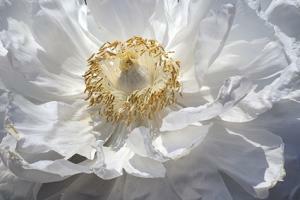 Peonies tolerate light shade but will flower less profusely. While plants are low-maintenance perennials once established, they do require good soil preparation. Peonies need well-drained, fertile soil. They don't like to sit in water. Use compost to amend your soil if necessary. These flowering plants are long-lived; some have even been known to live for 50 to 70 years. Peonies like rich, moist, well-drained topsoil and tolerate full sun or partial shade, though in hot southerly climates they are happiest with morning sun only. Fall is the best season for planting so the roots can get well established before top growth begins the following spring. However, spring is also an acceptable planting season. 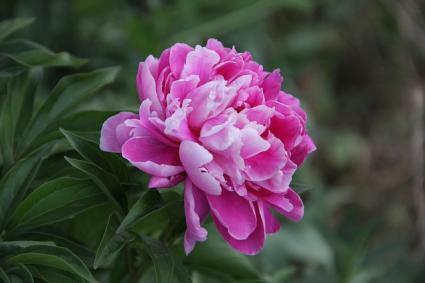 Peonies may be purchased as bare-root plants for planting in the fall. Container-grown plants may be planted in the spring. Proper planting depth is important; if buried too deeply they will not bloom. Plant so their crown buds are no more than two inches below the soil surface. Choose your planting site carefully; plants don't like to be moved. Be sure to space at least three feet from other plants. They will fill in the space as they mature. After planting, place 2 to 3 inches or organic mulch around the base of each plant. Mulch helps retain moisture in the soil and keeps down weeds. Don't let mulch touch the stem though; wet mulch on the crown can cause it to rot. Plants don't require much maintenance. If your plant is thriving in well prepared, fertile soil, you don't need to fertilize it. Simply work organic material such as compost into the soil around the plant each spring. Provide regular water for the first season or two while the plant develops its root system. Once established, they are very drought tolerant. Staking is often necessary, especially for double-flowered or tall, weak-stemmed varieties. The easiest way to support is with a metal hoop, which can be purchased at garden stores. Place the hoop over the plant in early spring, and the stems will grow up inside the rings. Remove all spent blossoms as they fade. This allows the plant to put all its energy into its root system for next year's growth. Peonies don't need frequent division. In fact, they prefer not to be disturbed. But you may divide as a means to increase your stock or to ease overcrowding in an older clump. Late summer or early fall is the best time to do this. Dig up the entire clump and cut it into sections with a sharp knife. Be sure to dig deeply, as they have extensive root systems. Peonies are fairly robust plants that are rarely bothered by pests and disease if their preferred growing conditions are provided. Botrytis, powdery mildew, and other fungal diseases occur easily if the peony's soil is not well-drained. Poor air circulation also exacerbates these conditions, so it's important to not plant peonies too densely and to thin them out as they grow. If powdery white splotches, yellow deformed leaves, or any other signs of disease appear, remove the infected parts of the plant immediately and dispose of them to prevent it from spreading. Mites, scale, and aphids all show up from time to time on peonies, though these are easily treated with a blast of water from the hose or by applying insecticidal soap. They have large, finely divided leaves with flower stalks that rise up to three or four feet from ground level. Flower size ranges from the diameter of a golf ball to that of a dinner plate and they come in almost every color of the rainbow - white, yellow, pink, purple, red, orange and many and numerous intermediate shades. Many varieties have bi-colored flowers. Peonies are known for their many layers of soft satiny petals, but the form of the petals varies considerably from broad and flat like rose petals to tubular or curved in shape to spatula-like to almost frilly. 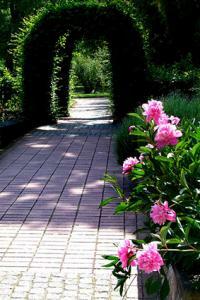 Peonies are commonly used in perennial borders, cottage gardens or in more formal gardens. Because of their upright growth habit, and sometimes scraggly summer foliage, it's best to place peonies in the mid-ground of a mixed border planting so there is something in front of them to conceal the base of the plants. Peonies have a woodsy look and are often included on shade garden though they flower much less if they don't receive at least four hours of direct sun each day. Thus they are well-suited to the edge of woodland where plenty of sun can reach them. Some varieties available today are old favorites. There are many interesting new introductions as well. Early-, midseason- and late-blooming cultivars are available. Here are a few varieties to try. Festiva Maxima produces huge, loose rose-like flowers of pure white flecked with crimson. Its vigorous habit, fabulous color, and fragrance have made it a popular cultivar for over 150 years. Blooms early. Duchesse de Nemours, a midseason bloomer, produces large, fully double, pure white flowers. The flowers of this old favorite are very fragrant. Foliage is deep green and divided. Bowl of Beauty is perfect for a border of warm summer colors. Fragrant Japanese blooms boast pink outer petals surrounding a cream center. Blooms midseason. John Harvard blooms mid-season with magnificent, dark red, single to semi-double flowers. Sarah Bernhardt is similar to 'Duchesse de Nemours', but with soft pink flowers and medium green leaves. Late-blooming flowers are lovely in the garden or as cut flowers. Fernleaf have finely divided fern-like leaves and dark red flowers in mid to late spring. The flowers are single except for 'Rubra Plena', which bears double flowers. 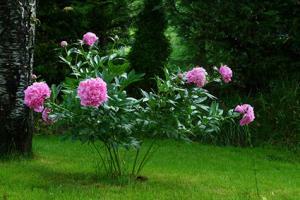 Because peonies have short bloom periods, you will want to plant them with other flowering plants. Flowers combine well with a wide range of perennials and shrubs. Plant in front of Phlox paniculata. Just as the blossoms are winding down, phlox is getting ready to put on its show. 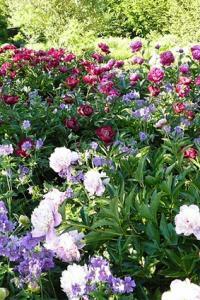 Peonies mix well with flowering trees and shrubs such as late-blooming lilacs. Interplant with spring bulbs such as tulips or daffodils to mask dying bulb leaves. Other perennials to complement include columbine, coral bells (Heuchera), iris, and catmint (Nepeta). Peonies are one of the most majestic species to include in a perennial border. Unlike many perennials that fade away after a few years, peonies bring their beauty to the garden each spring for a decade or more.